Updated 1-04-19. Looking for a new cardiologist or electrophysiologist? Here’s a worksheet with a list of interview questions to ask each doctor and an area to note their responses. Print a copy of this worksheet for each doctor you talk to. AFTER your interviews: learn what their answers indicate. Go to our Finding the Right Doctor For You page and compare each doctor’s answers our list of possible answers and what they may mean to you. Download our Free PDF worksheet (separate browser window will open). Updated 1-04-18. Customize and print a free personal emergency medical ID wallet card. Use the AllFreePrintable online form (with nothing to install or download). Print, trim, fold and add to your wallet or purse. Information entered is not stored for any purpose. When you close the print window, all information is deleted from your computer. For two more Free online sources to print a personal emergency medical ID wallet card, go to our article, Your Portable Medical Information Kit. IDEA: You might want to get your card laminated to prolong its use (an office supply store can help). By Steve S. Ryan, PhD. A-Fib can be a life altering disease―yet people with A-Fib don’t look sick. When a patient is diagnosed with Atrial Fibrillation, family members often struggle to understand what their loved one is going through. A-Fib not only impacts the patient’s health and quality of life but also the lives (and often livelihood) of their loved ones and co-workers. These are the most asked questions from family members. Read more and download ‘Top 10 Questions Families Ask about Atrial Fibrillation’. Print and keep this illustration handy for the next time you talk with your doctor about the workings of your heart. Space provided to make notes directly on the picture. To get yours, just download and store on your hard-drive. 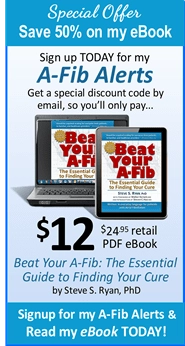 To have one handy when you need it, print and store copies in your “A-Fib Binder or folder“. With permission of the Cleveland Clinic. Download the illustration. 3-16-19 Corrected missing link to PDF. Before starting any drug, it’s best to educate yourself first. To help you, we’ve prepared the ‘Top 10 Questions to Ask Before Taking Any Drug‘ you should ask your doctor. Use our FREE PDF worksheet with convenient spaces to jot down your doctor’s replies. Download and print as many as you need. Take a copy to every doctor appointment (you never know when you’ll need one). Download our worksheet (remember to save to your hard drive). In our 12-page Special Report, we examine the actual O.R. report of the catheter ablation of Travis Van Slooten, publisher of Living With Atrial Fibrillation performed by Dr. Andrea Natale, Austin, TX. View a recent issue. 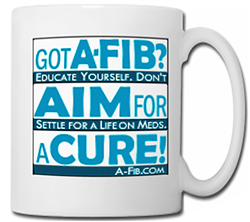 Get your A-Fib news the easy way with Steve’s monthly A-Fib Alerts. The A-Fib Alerts format is quick to scan for the info important to you. 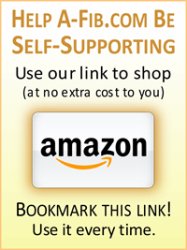 Why not get your own copy delivered directly to your email box? Sign-up Today! It’s Risk Free―you can unsubscribe at any time! Sign-up TODAY for my A-FibAlerts! Keep your doctor and other healthcare providers up-to-date on all the medications you are taking, and because they may interact, over-the-counter drugs, vitamins and mineral supplements, too. Download and use this FREE form to help you keep track of everything. Because your medications may change over time, print several copies of the blank form so you will always have a clean copy ready to use. (Keep with your A-Fib records.) Take a copy to each of your doctors or other medical healthcare providers. From the Privacy Rights Clearinghouse, a non-profit patients advocacy group, is a sample letter to use as a template when writing and requesting copies of your medical records.Click to download your free PDF(then print or save to your hard drive). In the US, under HIPAA legislation you have a right to copies of your records. 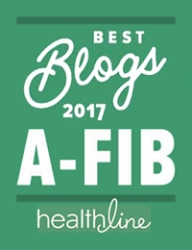 Read more at Finding the Right Doctor for You and Your A-Fib. From American Heart Association (www.heart.org). “A-Fib: Partnering in Your Treatment” worksheet helps you organize your questions before visiting your cardiologist after initial diagnosis. Click for free PDF, then print directily, or SAVE to your hard drive and print a color copy. 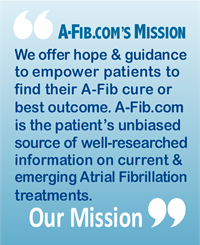 From the AHA webpage “AFib Resources and FAQ“. Related: see our Free worksheet download: ‘Questions for Doctors Worksheet‘ below. A five-page report compiled by Steve Ryan with the facts about Atrial Fibrillation. Includes related statistics and all statements are backed up with the reference citation sources. Read to educate yourself and learn about your disease. Share with your family and friends. And your co-workers, too. 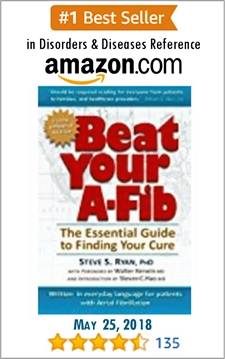 Click here for your AFib Facts Report by Steve S Ryan Free PDF download. (separate browser window will open).